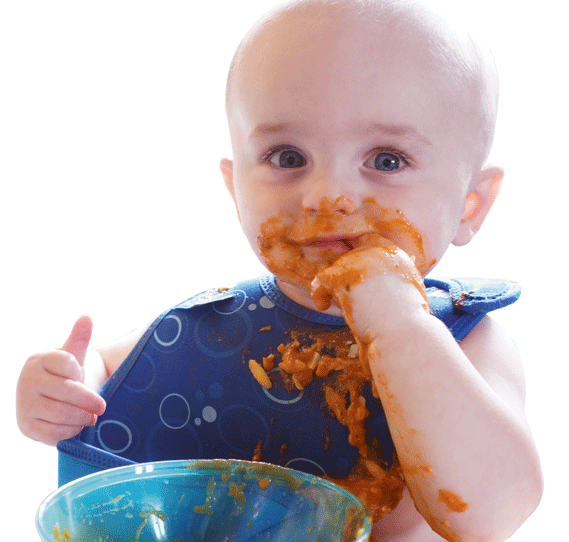 In recent years the idea of letting a baby feed themselves from the outset has really grown – like many concepts some would say it’s actually a return to the way things used to be done, a more natural way of teaching your baby to feed themselves without the pureed, processed mush and endless games of "here's comes the aeroplane" games! Of course others will pass it off as the latest fad. Fad or not, the government have really got behind the concept and have funded baby led weaning workshops across the UK. Plus a study carried out by the University of Nottingham, has shown that using Baby Led Weaning can help reduce child obesity in later life. They become more adventurous eaters and are more comfortable with a wide variety of tastes and textures whilst acquiring a natural feel for portion control. Initially you need to be brave while they discover their own gag reflex and there's no denying it's a lot messier in the early days!